The redesigned chamber features improved fuel distribution , spark plugs are located high and as close to the center of the chamber as possible and five angle intake seats shear the liquid fuel and air as it enters the chamber. The intake face, exhaust face and exhaust ports have been redesigned, valve guide bosses are profiled and casting walls are cleaner and more consistent, resulting in greater control over flow, heat and combustion. Multiple intake sizes are available to suit engines from mild street to big-inch full competition. Bolt on compatibility: Standard valve angle and spacing are retained to allow use of off the shelf pistons and valve train components. 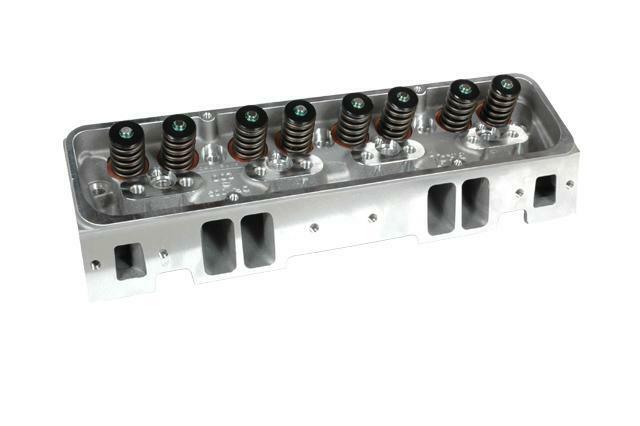 Choice of angled or straight spark plugs to clear manifolds and headers. Dual exhaust bolt pattern spot is provided for easy header fitment.